This week at Intertops Poker and Juicy Stakes earn leaderboard points when you hit designated hands playing blackjack and video poker. You can start earning points on Wednesday. The 30 players with the most points by next Tuesday night will win $2000 prizes. First prize is $300. When you play Blackjack you'll get one point for a Natural Blackjack. A natural Blackjack where both cards are Diamonds earns 20 points. A Big Suite 21 (Ace, 2, 3, 4, 5, 6) is worth 300 points. Two pairs win one point in Video Poker. A Flush is 20 points and a Royal Flush wins 300 points. Blackjack and video poker players earn points for designated hands. 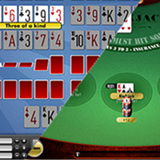 All Blackjack and video poker games by Lucktap are eligible. There are four types of Blackjack (regular Blackjack, Face Up 21, Double Draw and Perfect Pair) and nine video poker games (Jacks or Better, Deuces Wild, Tens or Better, Bonus Poker, Double Bonus Poker, All American, Aces & Faces, Joker Poker, Double Joker Poker ) to choose from. Contest details at Intertops Poker. Contest details at Juicy Stakes.